Goodgear supplies branded uniforms for the fitness industry including singlets with embroidery or screen printing, t-shirts with embroidery or screen printing, polos with logo embroidered or screen printed, active wear including leggings with logo branded and shorts with embroidery or screen printing. 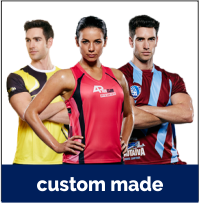 We also supply custom made uniforms for the fitness industry. We supply custom made hoodies, custom made jackets, custom made singlets, custom made tees, custom made socks, custom made towels, custom made track pants and more for the fitness and health industry. Contact Goodgear today for more information on custom made uniforms branded with your logo. Goodgear also supply branded products which make great merchandise items, including gym towels and sports towels printed with your logo, drink bottles printed with your logo, protein shakers printed with your logo, headwear including caps and visors with embroidery or printing, magnets with your logo and contact details printed, pens with your logo printed, umbrellas with your logo printed and sports bags with your logo printed or embroidered, keyrings with your logo printed or laser engraved. We supply many fitness centres, gyms and sports clubs with branded uniforms across the Central Coast. We also service businesses across Sydney and Newcastle regions. We can have your order delivered Australia wide, right to your door step. Our top brands include Biz Collection, Bocini, JB’s Wear, Gildan, Aussie Pacific, RAMO, Stencil, Gear for Life, James Harvest Sportswear and Australian Spirit. We offer a wide range of stock uniforms as well as Custom Made Uniforms, Central Coast Uniforms. Contact Goodgear today to receive a uniform catalogue or promotional product catalogue, see samples, receive a size set or receive pricing. All our uniforms and merchandise products are available in a wide range of colours, so we are sure to source a uniform that reflects your brand. Click here to see our special offers flyer for running events.